Awesome. Just. Awesome. I love a good history book, as people who know me at all know. Even more than that, I love a well-written, engaging, yet thoroughly researched and reliable history book. She had footnotes throughout the entire thing. The last two pages of every chapter were nothing but footnotes. I have a four-page list of to-read books gleaned from this book alone. I am in heaven.Oh, and the book? Interesting, informative and well-written. I love how she presented the information in a well-structured, cohesive manner. She didn't jump around too much in the timeline. I was impressed with her ability to move onward from the inception of the Knights Templar to their dissolution without tangetializing too much on the individual events that led up to the dissolution. She still covered the individual events in depth, don't get me wrong -- but each of those individual events (obviously) has other events that tie into them, with others that tie into them and so on and so forth. Ms. Newman has quite the ability to stay on topic.I also enjoyed the last few chapters, where she addresses some of the myths and pseudo-histories that have arisen around the Knights Templar. I have to admit to some flabbergasted curiosity at some of the things she hinted at. 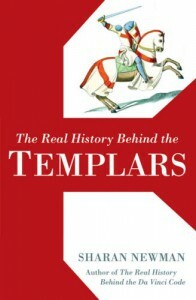 Because of this book, I want to learn more about The Hospitallers, the Inquisition and the various Crusades. I was absolutely fascinated at the wealth of information that glimmered on the edges of this book, tangential to the topic at hand but still oh-so-alluring.